Stick your neck out with Dr Renaud, PCA Skin and Philosophy! Laboratoire Dr Renaud Pure Neck & Decollete - 50ml - $51.95 - with a unique formulation that combines a lifting effect with a firming and anti-wrinkle action to remodel the neck, reduce a double chin and smooth the decollete for improvement of skin texture. Contains Acetyl Tetrapeptide-9 - expert peptide, Centella Asiatica, Pea Extract, Glaucine, Calcium and Essential Nutriments. And free of parabens, alcohol, colourants, mineral oil or any toxic ingredients. Available at spas and clinics across Canada - go to www.ldrenaud.com to find a location near you. 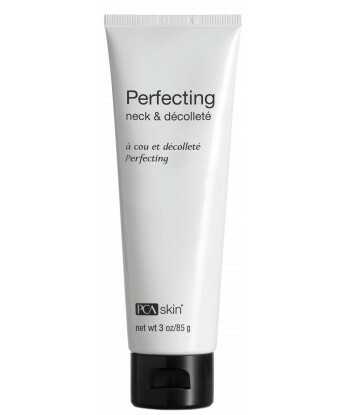 PCA Skin Perfecting Neck & Decollete - 85g - $75 - specifically formulated for the delicate skin on the neck and chest to improve laxity, wrinkling, hyperpigmentation and persistent redness and provides smoother and younger looking skin in as little as one to five weeks. Contains Palmitoyl Tripeptide-38 - to minimize the appearance of fine lines and wrinkles; Palmitoyl Tripeptide-5 - to stimulate collagen production to strengthen skin and minimize wrinkling; Vitis Vinifera Fruit Cell Extract - to protect epidermal stem cells from damage; Calcium Hydroxymethionine - fortifies and restructures thin, fragile skin; Niacinamide - minimizes hyperpigmentation, impaired barrier function, breakouts and skin redness; Rye Seed Extract - stimulates the synthesis of stress fibers to reduce laxity in the skin; and Vitamin A - promotes a clear complexion and an even skin tone. Check out www.beautynext.com for details on where to purchase near you. Philosophy Miracle Worker Miraculous Anti-Aging Neck and Decollete Cream - 60ml - $59 - a light and silky textured, targeted, anti-aging care for neck and decollete and is formulated to help improve the appearance of wrinkles as it supports collagen and improves elasticity for firmer looking skin. A nurturing blend of omega 3, 6 & 9 essential fatty acids deeply hydrates and smoothes skin while a multi-active form of vitamin C helps brighten and even skin tone. Available at select Shoppers Drug Mart, Sephora and The Bay stores across Canada.